A Cynical Guide to Peru: Chapter Two – Arrival. 27 hours after setting off, we had arrived. Puerto Maldonado. Say what you like about Puerto Maldonado, because they will never find out. Puerto Maldonado is an almost impressively isolated city, which describes itself as ‘the gateway to the jungle.’ This gateway was first formed around 1889 as the rubber trade in South America boomed, and Peruvian ‘rubber baron’ (no really that was a real title I looked it up) Carlos Fermín Fitzcarrald ventured into the jungle to seek out this valuable resource, with a worker force of Europeans. Anyone that has glanced at a history textbook can predict what happened next. The Amazonian natives were all but wiped out by a western disease 4 years later. Even so, Fitzcarrald declared his newly created settlement to be of extreme strategic importance, and then drowned when his boat sank nearby. 12 years later, Peru’s government sent out a party to explore the jungle, and used Puerto Maldonado as a much-needed place to rest, although at this point it was not named as such. The settlement was officially named Puerto Maldonado in 1902 after Faustino Maldonado, who explored the region in the 1860’s and drowned in some rapids. You can see a pattern starting to emerge. 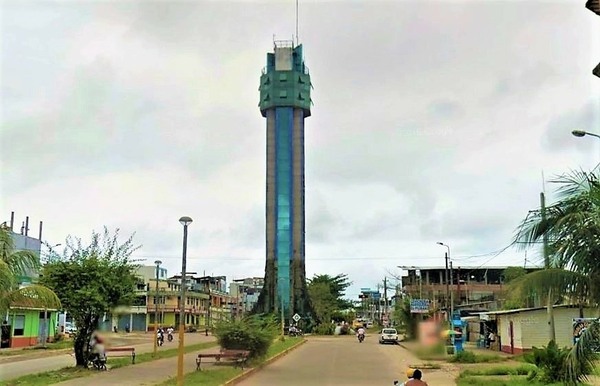 It was not until 1985 that Puerto Maldonado was named official capital of the Madre de Dios region, and I shudder to think what the competition looked like. 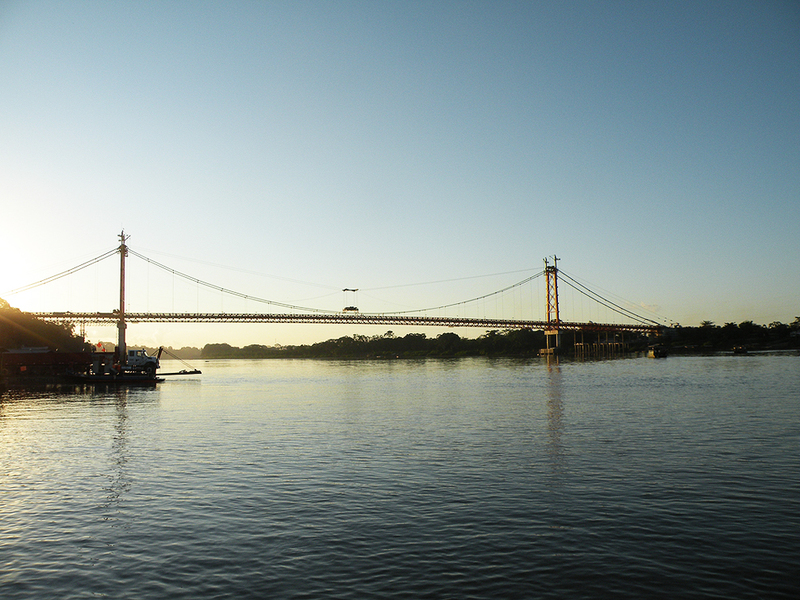 The city is situated at the confluence of the Tambopata and the Madre de Dios Rivers, which feeds into the Madeira River, which feeds into the Amazon River. It is the potamological equivalent of knowing someone who knows someone who knows someone who saw Lionel Messi that one time. The only notable features are the bizarre Golden Gate style bridge that stretches over the river confluence; the Plaza de Armas, full of people trying to sell you suspicious yoghurts; and the Eye of Sauron. Matt and I stepped out of arrivals and into the jungle air, the kind that sticks to you like treacle. The car park was awash with rainforest guide tours cramming people into minibuses, whilst tying their luggage to the roof with rope that looked like it previously held Fitzcarrald’s boat together. A man on his phone approached us. “OK, you wait here please,” he said, and then stood next to us in silence. After a couple of minutes, he informed us we were waiting for a man named Raul, who would be taking us to our hostel in the centre of the city. A while later, a diminutive man pulled up on a moped and introduced himself as Raul. “On that?” I asked, gesturing towards his moped. And before anyone could answer, he sped off. That interaction will baffle me for the rest of my life. We were then led to a minibus that had been parked up since we arrived, and driven through the dusty streets of Puerto Maldonado to the hostel. It did not look promising. The building stretched three stories into the sky and consisted almost entirely of concrete, except the roof, which was a fabric green mesh. You could smell the yellow fever. So it came as a genuine surprise as we walked through the entrance to find a pleasant and welcoming hostel, with showers, WiFi, and a rooftop bar. So why did it look so desolate from the outside? The answer to this came when we were informed that laws in Peru state a building or structure pays less tax if they are not deemed complete. Looking over the skyline on the rooftop, I could not help but think that, if such a law did not exist, this place might almost look respectable. Almost. I was told this was river mist, not smog. I remain sceptical. Previous PostA Cynical Guide to Peru: Chapter One – Hindsight Next PostA Cynical Guide to Peru: Part 3 – Relativity.